The final stage of our State-Of-NASA day starts with Lunch. If you turn up in the morning with a bit of cash, you can sign up for a box lunch, and I knew from before that it’s a good one. But luckily today, I left my cash at home so my lunch is the granola bar that’s been hiding in my computer bag since I’m not sure when. But, yes, luckily, since we’ve gotten back to the visitor’s center just in time for the start of the budget presentation, livestreamed via the big screen at the Exploration Center. There’s no time to eat more than a granola bar if I want both hands free to type & tweet. Sure, I’m a space fan, so it wouldn’t be out of line to assume I’m in favor of funding NASA. But of course, on top of that, my husband does work for NASA, so there can be an actual family effect from budget decisions. Though I’m really writing about a) the general budget picture and b) what it’s like at a NASA Social, I’ll avoid the budget topics that directly affect our family. No, wait, the budget issue that’s most likely to have a real, measurable effect on us isn’t some line item, it’s the regular sequestration of funds by our truculent Congresspersons. (As in, my husband hasn’t had an actual raise in more than 5 years.) And then there are those wonderful times when Congress shuts down the government and he and all his colleagues don’t get paid at all and proceed to complain (bitterly) that they have been told to stay home and not work. There’s nothing worse to a scientist than being told not to work. In any case, here I’m not aiming for a critical review, but more of a “what’s in the budget” overview. For this, we get: Landsat and all its kin providing Earth images, taking over all of NOAA’s earth-observing satellites except for the weather satellites, all of the current & upcoming Mars missions, Cassini, the Pluto mission (New Horizons), a mission to Jupiter, detection of near-Earth asteroids, all the space telescopes, the search for exoplanets, the James Webb telescope project and dozens of solar physics projects. Whew. For this we get air traffic management tools, tech for unmanned autonomous vehicles, and new technology development for air vehicles. the life-support system development for Orion, and development of laser communications systems. This is a big category, because it’s for big stuff, mainly the Orion system, for which the first test flight went so well. Next up is the Exploration Mission, an unmanned trip to the Moon and back. 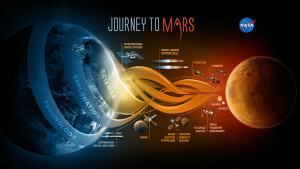 And of course it’s all about The Journey To Mars. 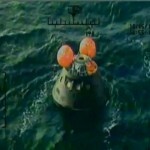 And a major subcategory is support for the development of commercial spaceflight. Like SpaceX and Boeing. but also the facilities for support of those space missions, from the satellite fleet that provides tracking to the launch support on the ground. Wow. No clear explanation for this, but education funding has been shaved by about 25%. There’re education-related funds under other categories, but this is the core education funding for NASA’s contribution to the Federal plan to support STEM education. That includes Space Grant and programs to get more minority students interested STEM and going on to earn degrees in science and engineering. This is in addition to some education funding budgeted elsewhere, totaling $26. That keeps all the NASA centers operating and takes care of any needed construction work (including environmental clean-up jobs). On average, between 2015 and 2020, we’ve got about 17 launches per year planned, of which about 13 have a science focus. NASA is taking on a lot of former NOAA stuff, like ozone monitoring, ocean altimetry, and non-defense Earth-observing satellites, leaving just the weather satellites in NOAA’s budget. But–wait for it–the proposed budget assumes that the venerable Opportunity rover retires this year. Wait. Whaaaat? Oppy has not even hinted at a desire to quit her roving ways. If the “science value” makes sense, then they’ll try to provide funding anyhow. 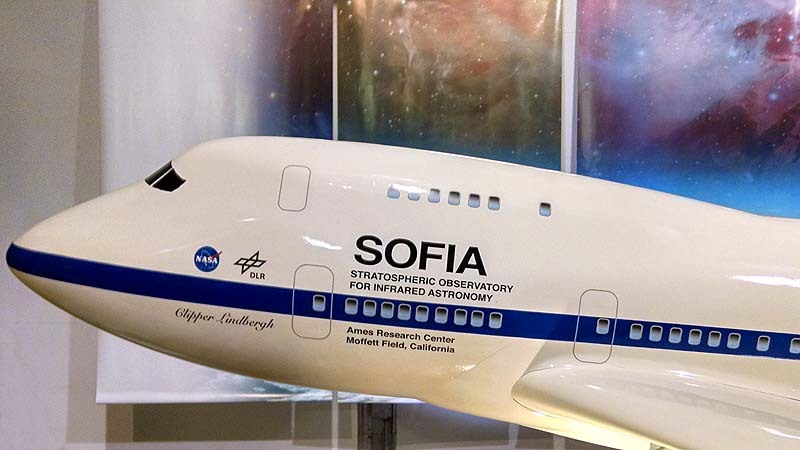 The Stratospheric Observatory for Infrared Astronomy (la bella osservatoria in volo, SOFIA) is fully funded in this budget request (last year, it wasn’t funded, but they got Congress to fund it later on, which kept the airborne observatory flying through fiscal 2015. No need for such machinations in 2016. Aaand, for a grand finale we get our very own presentation by Director of Ames S. Pete Worden and Ames CFO Paul Agnew. I’m actually awfully impressed, that this small group gets the attention of these top administrators, when I’m sure they’ve been through a similar session with the “real” media. Here’s the short version: Director Worden is delighted that the President supports a larger budget for NASA as a whole and happy that Ames is well taken care of in this budget, scoring its own $31 million overall budget increase with no cut in the education budget here. The special favorite is that solid funding for SOFIA, which is what bumps up Ames’ science budget. There’s funding for the CubeSats we saw today and for K-2 (the second-generation Kepler program) to keep ferreting out exoplanets around dwarf stars. And the upcoming new planet-finder TESS is in the works. 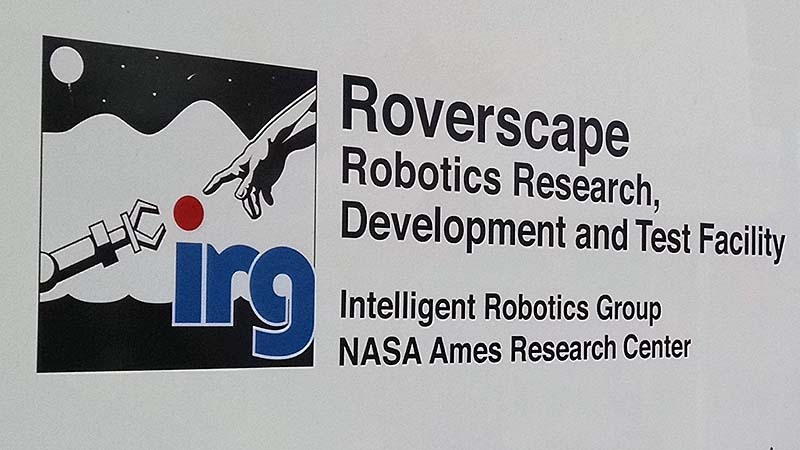 Ames is on the forefront in reentry systems and several other areas critical to the Orion mission, so those are in well as is the Intelligent Robotics Group. The guys across the street from the Roverscape, the advanced computing group, also have a stable budget for next year. And they are very pleased that Ames’ own SOFIA is saved for another budget year. I asked how Ames managed to keep its education budget stable when the agency-wide budget has such big cuts. I got a fuzzy answer, broadly indicating that a center’s education budget is affected by what that center asked for at the agency level, and that Ames has established a steady set of relationships and grants. The requested budget for NASA is $18.5 billion, an increase of about $500 million. But put this in context. The defense request is $605 billion. So, NASA is asking for about 3.1% of what the military is asking for, just for current defense purposes, not including taking care of our veterans. And that’s out of a total budget of $4 trillion. So the President is asking if it’s OK if he spends 0.04% of our taxes on exploring our solar system, establishing a human presence in space, and using space-based research to find out all kinds of cool stuff that will help people on Earth. So now we just have to wait and see what happens in Congress. 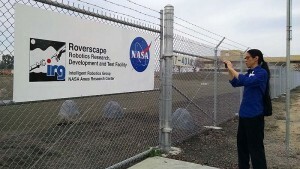 Groundhog Day at NASA-Ames: Episode 2, Live at the Roverscape! Before launching (pun intended) into this installment, I have to note some disappointing news from the European Space Agency’s ATV-5 mission. 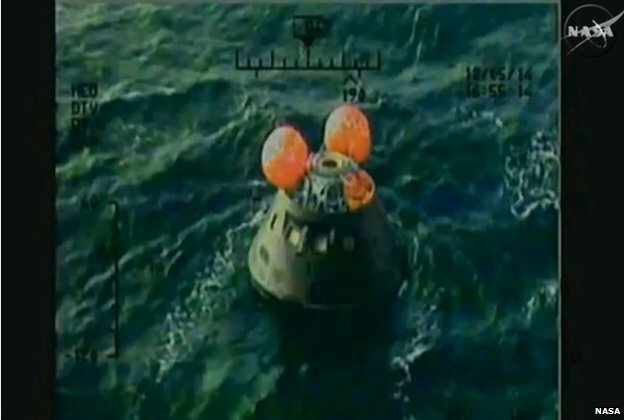 Due to a power issue, they decided not to do the shallow-angle reentry, which would require the vehicle to be in flight for an extra week or more after deploying from the ISS. 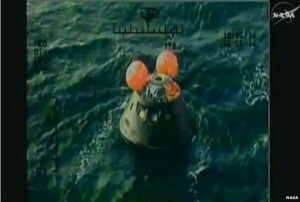 Instead, it completed its mission in a more typical reentry maneuver, earlier today (Sunday, Feb. 15th ). 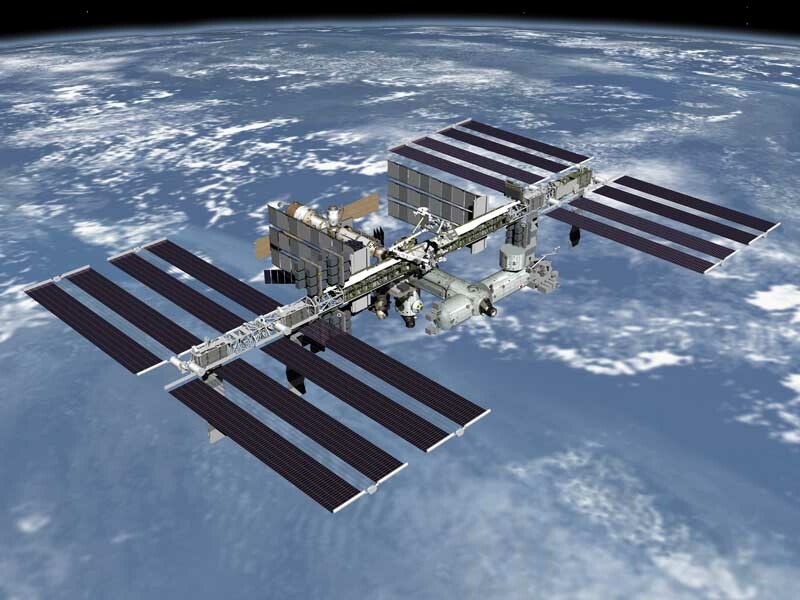 Oh, well, the astronauts saved the new NASA monitoring instrument aboard the ISS for use in a future mission. But it was not like we had anticipated. To cope with the loss, enjoy some NASA imagery from the reentry of Japan’s Hayabusa spacecraft. Once we’re done with the agency-wide event of the morning, we find our way to the dazzling outdoors and distribute ourselves between a shuttle van and a minivan with our NASA team and a service-dog-in-training, and we’re off to the Roverscape. I’m figuring we’ll get a few canned presentations about the rovers that roam that dirt lot, climbing its artificial hills and avoiding its alignements of obstacle-rocks. And I’m psyched for that. 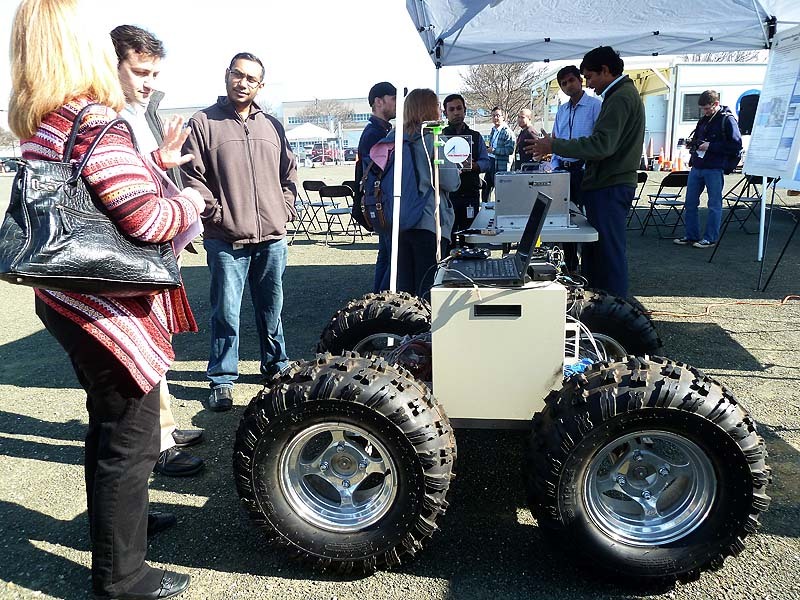 At Ames’ 75th-anniversary Open House, it was a crowd-fighting challenge to catch a glimpse of the rover patrolling on the other side of the barbed-wire-topped fence, subject to remote-control by a NASA roboteer hiding in plain sight under a pop-up tent in the parking lot. But no. It’s not a presentation in the parking lot. 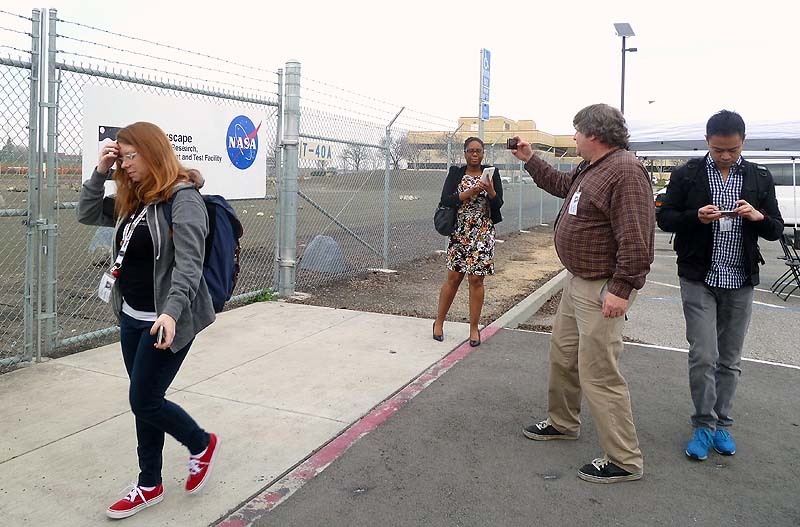 On arrival, our NASA Social Team quickly demonstrates thinking, writing, photographing, and connecting. Now, presentations are nice. But the thing is, if you’re at a NASA Social, you feel like you have to be tweeting and posting the whole time and it’s been pretty thoroughly proven that there is no such thing as multi-tasking. Which means while you’re tweeting and posting you’re missing stuff. Some folks handle that by simply recording presentations—you know, like the Real Media do. My strategy is to free-type notes, but that’s pretty dependent on having mad touch-typing skills. In any case, you don’t actually get much chance to interact with the people you’re there to learn from. Plus, for the presenters, gawd, there is nothing more tedious than being dragged away from your work to give a presentation to a bunch of people who seem to be playing video games and are not prepared to ask you questions. So today the Ames Media Relations Gang are trying out a new idea. They have rounded up a bevy of NASA engineers & scientists associated with seven different project groups. Each group has chosen a representative to give a three-minute “elevator pitch”. That would be either a) the one person who wasn’t there when the rep was chosen or b) a team leader who actually likes talking to groups. Then the social-media herd will be set free to scatter among the projects that have sparked their interest. This is an experiment that works well on several levels. First, the quick-posting tweeters get snippets of video of the pitch presentations & those are up on YouTube in nanosecs. Second, at first, the attendees naturally focus on projects that interest them the most. Third, because everyone’s free to wander, attendees also wander over to chat with folks whose topics weren’t as appealing at first. That means people discover new things. And they’re more likely to get excited about new discoveries. Fourth, because it becomes nearly a one-to-one discussion format, questions are livelier, connections are made, and, fundamentally, everyone has a better time. The sole downside is, for an old-school note-taker like me, it’s tough to shoot photos & video, listen, ask sensible questions, and get notes written down. Gives you some respect for the professional media, eh, what? I’m envying that old-style team of reporter + photographer. Target #1: Big Giant Roverbots! First off, I headed right for Terry Fong and the K-REX robot that was actively surveying the Roverscape. Strangely, no one else was chatting with him yet. Maybe they were scared off by his position as Director of the Intelligent Robotics Group, aka King of the Roverscape. But, seriously, Terry Fong is one the most personable robotics experts you can talk to, and others quickly joined me. 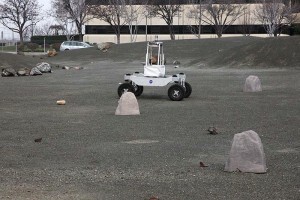 It was quickly evident that what people wanted were photos of the rover, so he suggested good shooting angles, led small groups close enough for the rover to demonstrate its detection-and-avoidance behavior, and (near the end of the event) asked his crew to go to RC mode for a bit so the rover wouldn’t trundle away so determinedly. 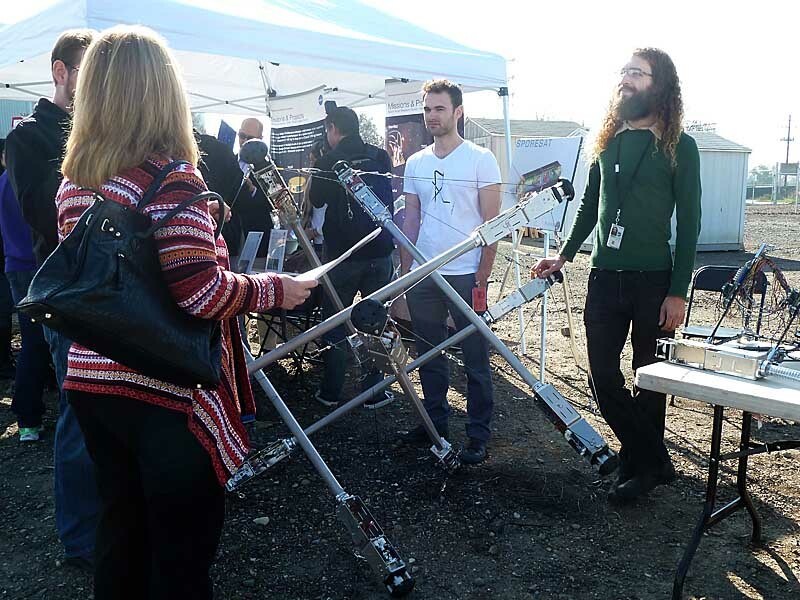 The current design mission for the K-REX (which is the upsized younger sibling of the workhorse K-10 robot platform) is developing prospecting tools and algorithms. 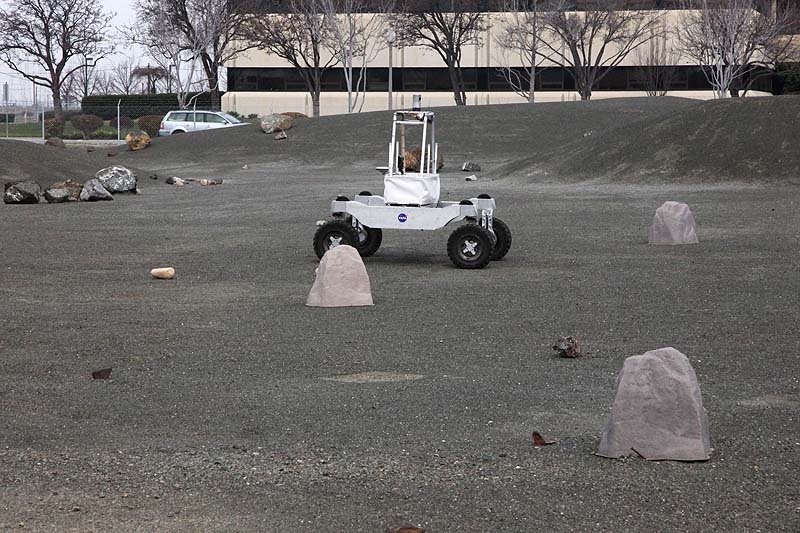 For survey missions, the rover can use a variety of tools from ground-penetrating radar to its 3-D GigaPan camera. But the hot topic of the moment is seeking water ice under the surface, for Lunar and Mars missions. But how do you “see” underground water? Robots, not being prone to faith-based data acquisition (or confidence tricks), aren’t good at dowsing. But water contains hydrogen, and each hydrogen nucleus (i.e., a single proton) is just the right size for interacting with a neutron in a measurable way. If you fire neutrons into the ground, they’ll penetrate about a meter, while bouncing around among the component atoms. Eventually, some will bounce back out of the surface. Ones that have only hit large, heavy atoms will be flying at close to their original velocity. But the neutrons that have struck hydrogen atoms will be slowed down significantly. 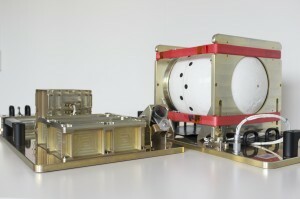 The HYDRA neutron spectroscope detects the relative fraction of slowed-down neutrons and reports high hydrogen concentrations. Lots of hydrogen almost certainly means H2O. The team recently took their rover on a practice mission to search for water in the Mohave desert. Will K-REX find water under the pebble patch? 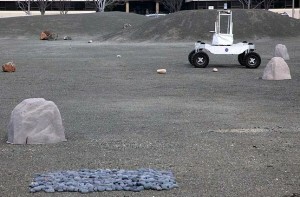 One factor they are teaching the robots to work around is the varied character of the surface of the ground, so at the Roverscape, there are test patches of gravel, smooth pebbles, sand, and even shale rocks with smooth surfaces and jagged edges. At the far end of the row of tents were a couple of guys with, sadly, no active robots to play with. And no one hanging around asking them questions. So, ever happy to avoid a crowd, I left Terry and made a bee line for their display. And discovered the team working to protect us all from wild mobs of flying robots clogging our skies. No, seriously, have you not worried what’s up with drones these days? Anyone can pick one up on Amazon and start zooming about. There have already been legal cases with “peeping tom” drones. And towns arguing about whether or not to legalize shooting down drones above, say, your ranch property. More prosaically, but even more seriously, a drone wandering into airspace populated with passenger airplanes poses serious safety issues. Back in the early days of airplanes, there were similar issues of privacy, rights of transit, and safety. In his State of NASA address, Charles Bolden trotted out the NASA aero mantra, “NASA is with you when you fly”. Did you know that on top of cool aero hardware, NASA has been involved in air traffic control & collision avoidance? Now it’s time for UAV traffic controls. 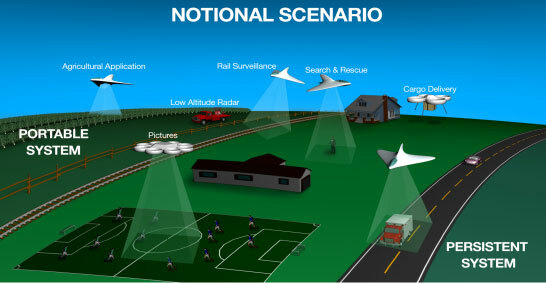 In big words, we’re talking: Unmanned Aerial System (UAS) Traffic Management (UTM). 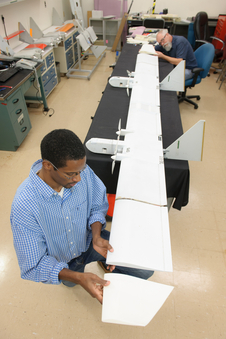 This mission involves devising both regulations and technology, because UAV’s need to be smart enough to “know” the rules and to recognize and avoid “forbidden” space. 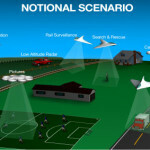 The timeline is short, as the drones are already out there—with lots of useful and fun applications but just as many problematic situations—so the plan is to have essential systems for safe airspace in place within five years. The proposed solution space incorporates static elements (“geofencing” to tag keep-out zones) and drone smarts (to detect geofences and manage routing) to build, by stages, a comprehensive system allowing for autonomous operations which maintain secure areas and safe travel. I only wish they’d been able to have a live drone to play with and illustrate their points. Because, you know, objects in flight. Target #3: The One I Missed, But Oh, Well, Didya Know…? The guys next door had a huge UAV on their table, but, well, it was popular. I never did get to talk to them about it. Luckily Tokiwa Smith (@Tokiwana–follow her on Twitter, ok?) tweeted a good photo, so I was able to ID that fierce flyer as FrankenEye, a hybrid creation built largely by a group of student interns using parts from the NASA Dragon Eye UAV’s and their own 3-D printed parts. Target #4: Innovative Bots Based On Baby Toys. Seriously. Next up: the tensegrity bots, a NASA research project which has involved university students and professors from Ghent University to UC-Berkeley to Case Western Reserve. We got our introduction from Vitas SunSpiral, a Stanford-trained innovator whose company is a contractor for the IRG. Yes–one way to work “for NASA” is to work for a company that works with NASA. These folks are thinking so far outside the box that there isn’t any box left. They’re most fascinated by designing structures with great flexibility, analogous to our own flexible spines and spring-loaded tendons and joints. For their inspiration, they’ve turned to the toy universe: remember those springy rattles or balls made of sticks and elastics? At the Open House, I’d seen the large prototype that they’re sharing at this event as well as a prototype Berkeley students had built using LEGO Mindstorms. (SunSpiral told me that excited kids at the Open House partly disassembled the LEGO version.) They’ve even dubbed this design a “Super Ball Bot”, reflecting the nature of the device is to be “bouncy” in a flexibility sense (and it also works as a pun on the robotics event “Bot Ball”, though I’m not sure that’s intentional). The Ball Bot moves by adjusting tension in cables connecting the rods in response to dynamic pressure signals transmitted through this physical network. The result is a slow rolling peregrination. Theoretically, this device is its own safety net: it could roll to the edge of a cliff, drop down, and land safely. Eventually, a payload can be added, suspended in the middle of the “ball” and protected by the springy structure of its un-legs. OK, there were people nearby showing off tiny satellites, but I needed a big-robot fix again. The guys from the “Health and Prognostics” group were displaying an older-style roverbot with a laptop perched on top of it. “Health and Prognostics for Optimal Mission Success” What? Huh? What’s this all about? Health? Is this a bot that helps keep people healthy? I can tell from some of my fellow NASA Socialistas that this is the first-line guess, because that’s how they tag the first photos they tweet. But, well, no. The “Health” under consideration here is the device’s own health. 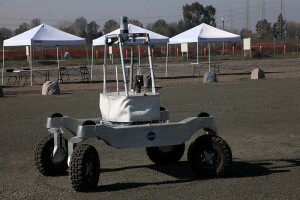 For this prototype, the robot assesses the status of its battery packs and then has to decide if it’s up to completing the mission it’s been assigned: driving an assigned path and returning to base. It may need to eliminate some waypoints to safely complete at least the most critical stops on its route and skip the lower-priority stops. 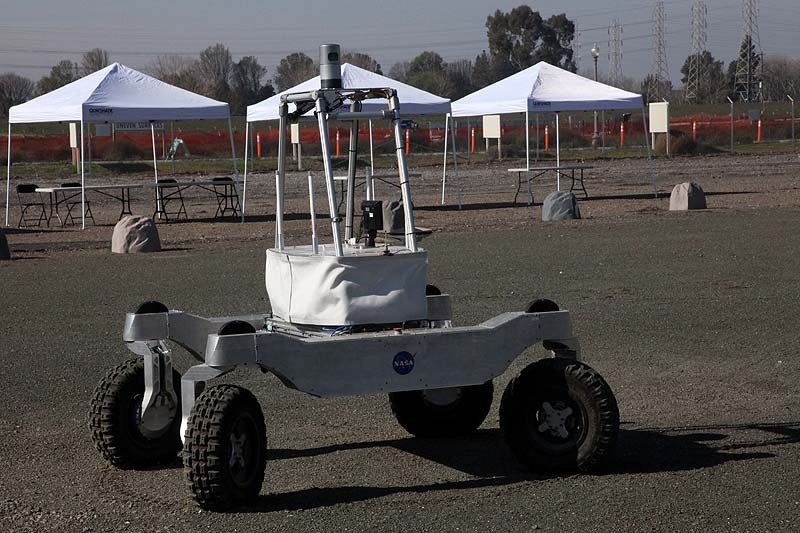 Consider that an autonomous survey rover on the Moon or Mars must be able to get itself back to its charging station and still make the cost of its construction and deployment worth the investment. The laptop on this robot is displaying its “thoughts” as it assesses its assigned route and redesigns that route in response to having one of its battery units disconnected in a recent experimental expedition around the streets right near the Roverscape. But, wait, there’s more! To do this job well takes more than an instantaneous measure of how the batteries are doing. This crew has tested batteries to build a system which predicts battery status in the course of the mission—that’s the “Prognostics” in the heading. And that’s also information that is already set to be applied in batteries for electric cars–because this robot uses the same batteries. It’s unfortunate that the nomenclature leads to a natural confusion here. This is a new field in systems engineering, one that truly sounds like something to do with medicine: Integrated Systems Health Management, or ISHM. I’d’ve picked a different word than “health”, but systems engineers have used that term for so long, it would have been hard to change. In any case, what’s important (and, analogous to biological health) is that it’s all about maintaining systems, and in this context a “diagnosis” isn’t determining the cause of a rash but more like asking a smart device, like, say, the starship Enterprise, to give itself a check-up, that is: “run diagnostics.” This has applications in any area with multiple components with failure potential. Here, we’re seeing it applied to an exploration rover system. 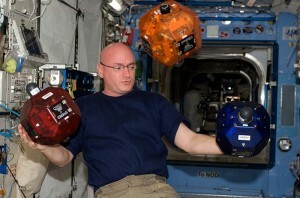 OK, as I plunge over the 2,000-word line, check out those little cubes that Astronaut Scott Kelly is playing with here. I only got to look around the shoulders of others talking to the SPHERES crew, but I got the gist just fine. First of all, they’re not cubes, they’re SPHERES. Yes, clearly the acronym was assembled to be cute. But the job of these babies is cool: they are flying ISS helper bots designed to be used as test beds for small satellite designs which include satellites which can work together to perform tasks in space. They’ve been under constant development since their first flight in 2006. 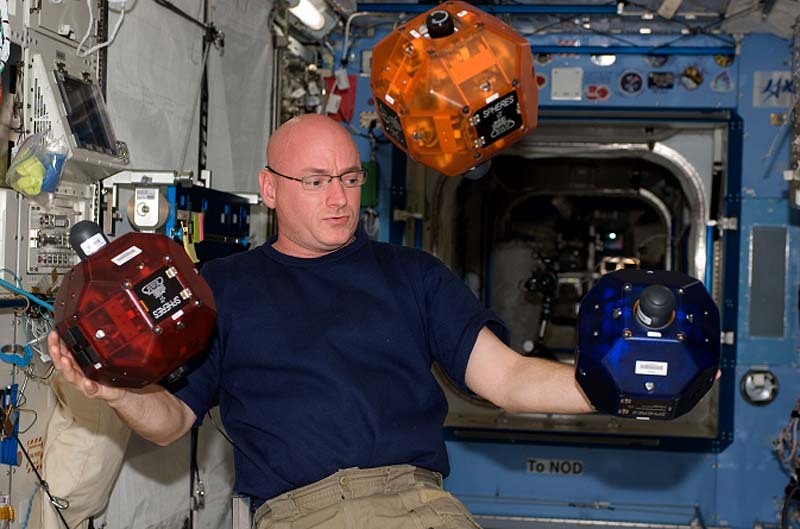 The original-style SPHERES in this photo aren’t really being juggled, they’re navigating within the ISS using echolocation, using fixed-position ultrasound transmitters in the ISS to establish their location and relative positions. The most recent versions are “SmartSPHERES” equipped with smartphones to communicate rapidly and enable image-taking and provide potential for vision-based navigation. The resemblance of the SPHERES bots to the “remote” droids in the Start Wars franchise is no accident: the original SPHERES were designed by MIT students in response to a challenge from their professor to build him one of those droids. Since then, the SPHERES have continued to be influenced by students, as students have been able to “fly” by writing programs for SPHERES to execute. I could see others moving towards the exit (and some groups packing up their displays), but I squeezed in a quick conversation with one of the CubeSat team members. What the heck’s a CubeSat, did I hear you say? Well, CubeSat is a modular design for a nanosatellite (i.e., a really small satellite). Each CubeSat is composed of a specific number of same-sized cubical “units”. Oh, and though the SPHERES bots look like cubes, a CubeSat “unit” is actually meant to be cubical: nominally 10x10x10 cm (though if you nit-pick, the specs come out closer to 10x10x11cm). A CubeSat is assembled as 1 or 2 or 3 such “units”, with 6-unit and 12-unit cubesats in the works. Look at it this way: a 3U CubeSat is a bit smaller than a 12-pack of soda…roughly the size of a standard roll of paper towels. The beauty of the small and modular design is that it opens up satellite-building to students, small businesses, and even hobbyists (though not everyone will score a launch ride with NASA). You don’t launch a CubeSat from Earth. You launch it from space, by hitching a ride up to the ISS (or further) and having it slung from there to its desired orbit. When Orion runs its test flight to the Moon and back in 2017, it’s hoped that a few CubeSats will be able to hitch a ride and be launched from the orbit of the moon, for placement further from Earth. For instance, solar physicists would love to see an array of little satellites spread out around the sun, so they could see the activity over the entire solar surface at one time. My captive researcher was was happy to talk but eager to get going as well, because she’s involved in an important test scheduled for “very soon”. We’d like to be able to send small payloads to Earth. So far, the final parachute drop has been tested. The ability to communicate with the microsat during transit, using the the Iridium satellite network (yep, the smartphone network) for rapid interactive data handling has had testing, and we know how to pop the device out from the ISS. The exo-brake is a parachute designed for use in the low-density upper reaches of the atmosphere to steer the payload on the right course until regular parachutes can be deployed. 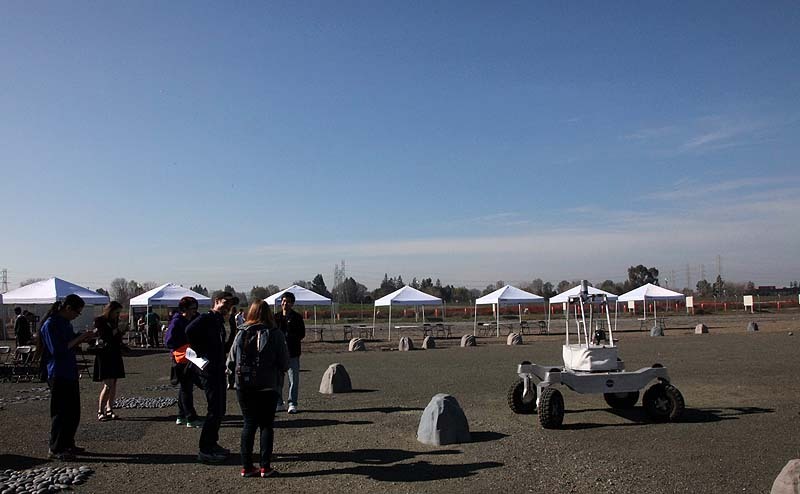 The upcoming test is the deployment and descent of TES-4, a CubeSat project involving San Jose State University students. 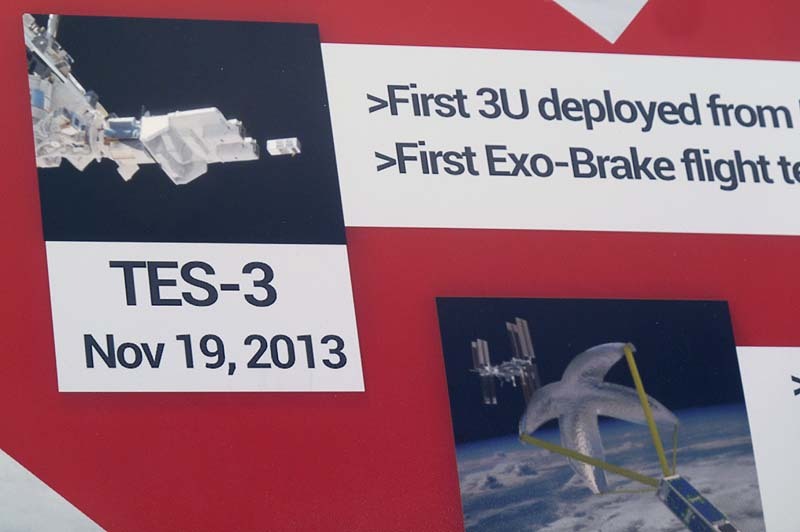 They’ll be testing the latest exo-brake and applying the Iridium communications system. And then, finally, the call came for us all to exit the Roverscape. I walked backward and took the time for one last photo of K-REX before scrambling back aboard our vans for the ride back to the Exploration Center. This is my second “NASA Social”, part of a new(ish) PR program at NASA which is (successfully, I should add), linking the venerable government institution with this modern social-media-dominated universe. 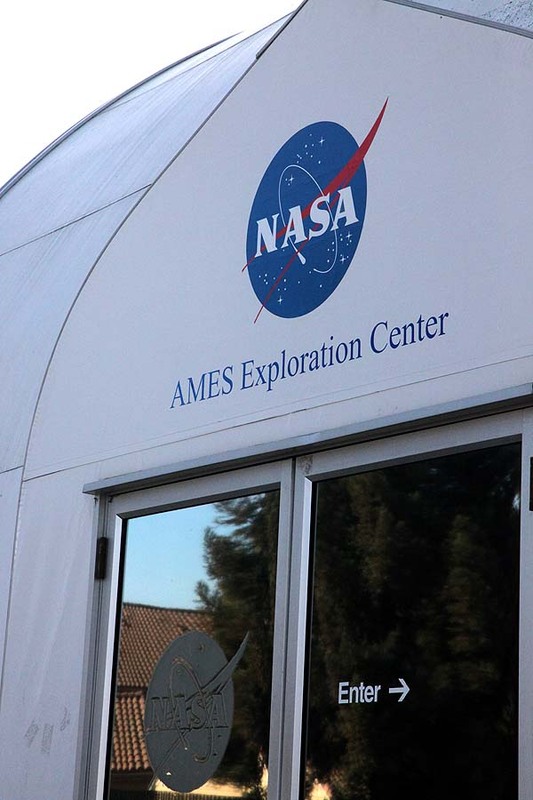 At Ames Research Center, which just celebrated its 75th birthday, I even qualify as “younger generation.” That alone is worth the price of admission. Last time, I stayed in the Facebook & Twitter world; this time I worked on my photos & videos for the blog. While I may not tweet as rapidly as those youngsters sporting Google Glass, I hope I’m bringing a relatively-informed viewpoint to the show along with my fangirl attude. Yeah, I know. 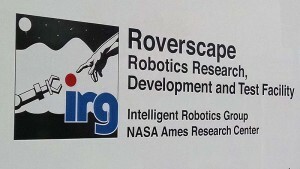 I have my own engineering Ph.D., but I’m still a fangirl when it comes to space stuff, science stuff, and robot stuff. And the best place to find all that stuff is still NASA. OK, so, I’m expecting this one to be relatively dull, as the thrilling event of the day is The State of NASA (insert non-martial fanfare here) address being livestreamed from Kennedy on the big screen at the Ames Exploration Center. 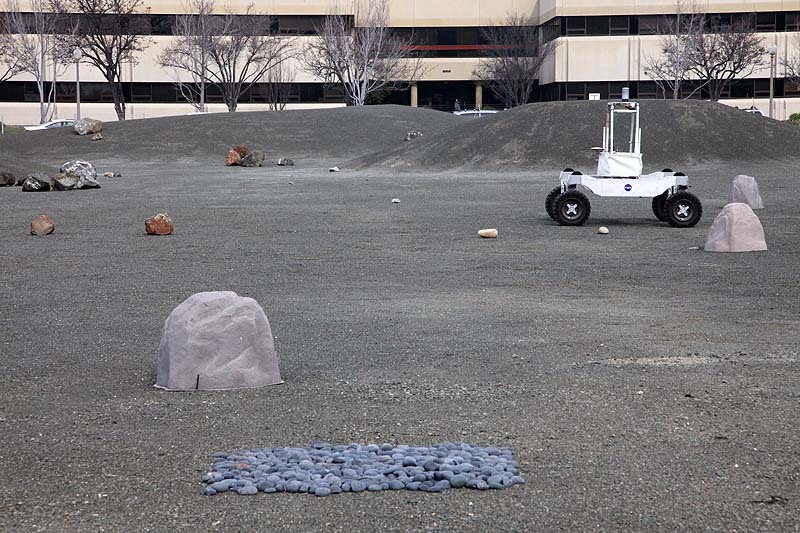 The last-minute info email the Ames team sent out last night hints at more than that: a “preview” of the ATV-5 re-entry, a “tour” of the Roverscape (a dirt lot with rocks in it), and (oh, joy) all about the new budget proposal. Waiting for the livestream from Kennedy Center to get under way, it becomes clear we’re really just watching NASA TV, only without access to the DirecTV remote. 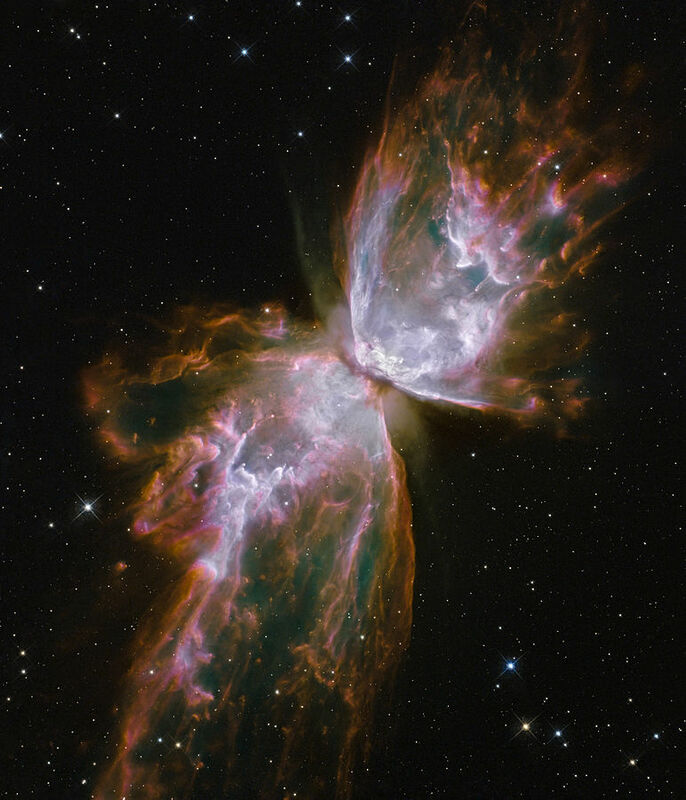 There’s a very brief, flashy video of inspiring fun NASA images: think ooh! ahh! all accompanied by the voice of the lovely Peter Cullen (aka Optimus Prime). 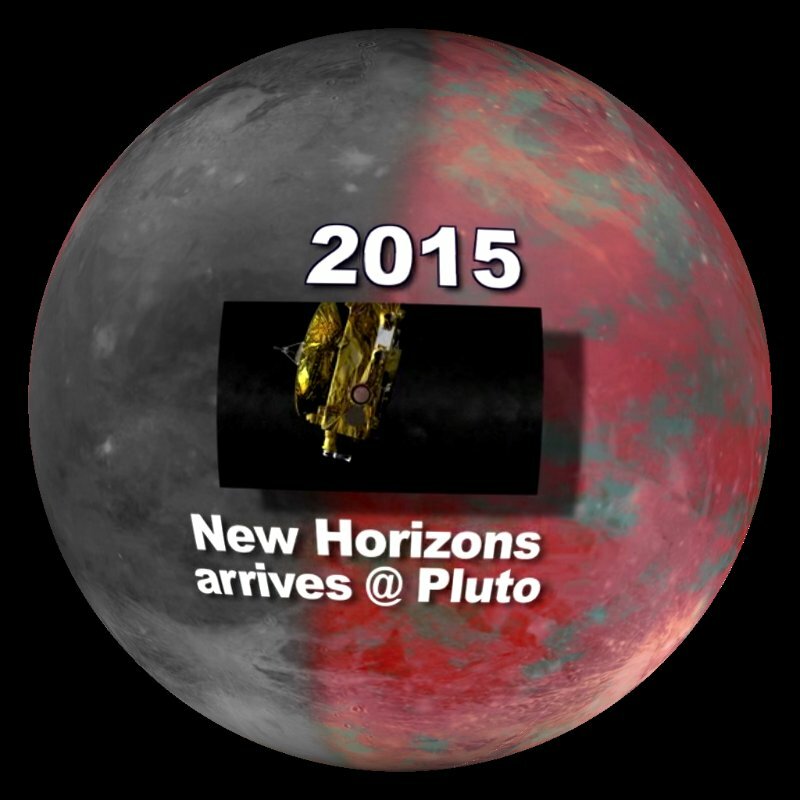 But then NASA TV switches to their familiar old-style rolling globe image with a static “coming next” title. No sound, just a slide. Not something that would get a channel-skipper to pause and watch. 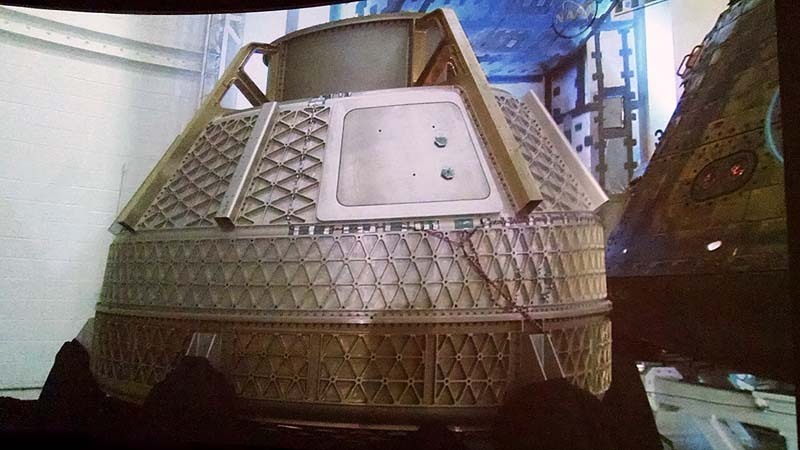 A teasing view of the crowd jostling for seating and the Director finding his spot in front of Orion would be more engaging. Maybe they could bring in an intern from a college media studies program to keep viewer interest up when there’s a little delay in an event startup. Well, you can watch the State O’ NASA message yourself on YouTube, to get the full effect. It’s only a half-hour, plus that four-minute preview video featuring brief glimpses of the work NASA is doing, with Real Scientists and Engineers. And robots. And Astronauts. Run it in the background while you’re updating your Facebook. Make the kids watch the preview, maybe inspire them to consider training to work at NASA someday. What you get here is a few my own off-the-cuff reactions and observations. No surprise, The Journey To Mars is still a core theme. If you’re down on manned spaceflight, one thing I’m noticing is that there is a heck of a lot of science being packed into these projects. It’s almost as if the popularity of the notion of sending human beings to Mars is being leveraged to get more actual discovery accomplished. Hmmmm. As always, at least since Apollo ended, NASA’s a shoestring operation, and it’s rather astonishing just how many things are going on under that big umbrella. If you haven’t been paying attention, you might not know that our current NASA Fearless Leader is a former astronaut, Charles Bolden. He flew on four Shuttle missions between 1986 and 1994, so he was part of NASA for Reagan, G.H.W. Bush, and Clinton. Ten years after Bolden had left the astronaut business to go back to his first career (the U.S. Marine Corps), G.(noH.)W. Bush got so inspired by the success of the Spirit and Opportunity Mars rovers that he decided NASA’s new mission should be to get people back to the moon and on to Mars. And just five years after that, Obama put Bolden in charge of that mission, as well as the rest of the tasks NASA manages with a budget equal to about 3% the size of the defense budget. showing off its innovative weld-free design structure. Oh, and there were lots more people at Kennedy than we had at Ames. But at Ames, front-row seats were very accessible and anyone wanting to spread out over several seats was just fine. Just as I notice a poster peering out from the edge of the Orion capsule, with logos and addresses for all NASA’s social-media connections, the feed goes down. The smartphones rotate 90 degrees and are all searching for the livestream. OK, it’s not just Ames, it’s NASA TV. But, really. Hire that intern, guys. Well, it’s up again within a few minutes, though the audio is sketchy for a bit. What do interns get paid? Like, minimum wage, right? The Asteroid Redirect Mission (ARM) gets first mention in the context of pathway to Mars—though we still haven’t decided if the plan is to capture a whole small asteroid or to extract a chunk from a larger asteroid. 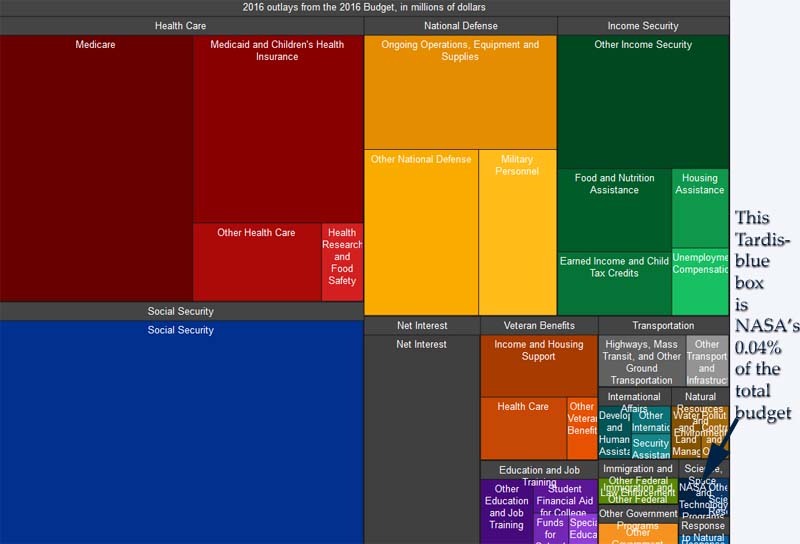 A glimpse of the budget comes next…there’s a bump-up of $500 million for fiscal 2016, though who knows what Congress will do with the budget request. Keep in mind that NASA’s proposed $18.5 billion is about 3% of the proposed defense budget and about 0.04% of the overall budget. How NASA can do this much with peanuts is amazing. Oh, wait. Suddenly I understand the peanuts ritual at JPL launch & landing events. from Hubble (which Bolden helped launch) to Kepler to James Webb. 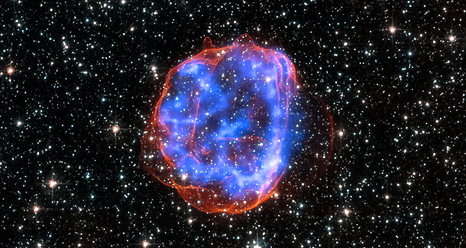 Even Chandra, which does superb work in the X-Ray spectrum, gets a mention this time. And the Solar Dynamics Observatory scores a slot in the closing segment. There’s a reminder that the money spent on space is money spent in the U.S., from small business to large ones, from textile mills to welding shops. 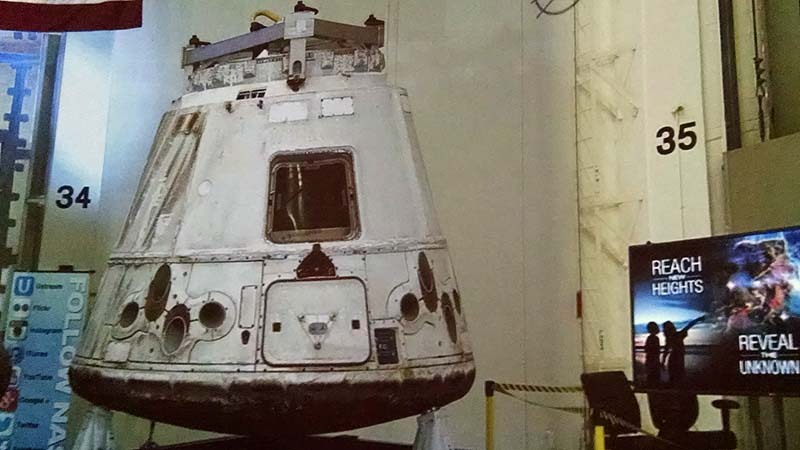 And the cash gets shared out, with 37 states having a stake in the commercial crew mission. Education gets a nod, though to be honest I’m a little disappointed that what gets the splash are the student science program at ISS and the flight of a student project on the Orion test flight. Those big projects still tend to end up at private and/or privileged schools, since it takes resources to play. I might have gone for a specific shout-out to one of the schools for which participation was a big leap, like Oakland’s Urban Promise Academy. Still, if there’s a kid doing a science report who hasn’t logged into a NASA website, then that kid doesn’t have internet access. All right, then we get a round of teasers on upcoming technological developments: “green” (less-polluting) propellants, advanced autonomous robotics, high-power solar electric propulsion, aviation advancements. NASA’s moving forward in its ongoing role in earth and climate science. 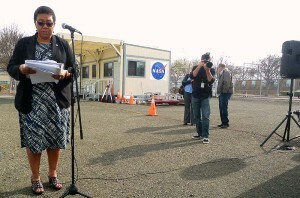 We’ve got that successful launch of the SMAP climate science satellite (http://smap.jpl.nasa.gov/), just a week ago, which has both direct practical applications for agriculture. And the Airborne Snow Observatory has already produced data to help with the drought in the West, especially California, where snowpack is key to water supplies. True to the core message, the closing draws focus back to Mars, promising a geophysics mission with the InSight lander scheduled to launch in March of next year. And a taste of special features planned for the Mars 2020 successor to Curiosity, including a way to shoot a sample back home to Earth.